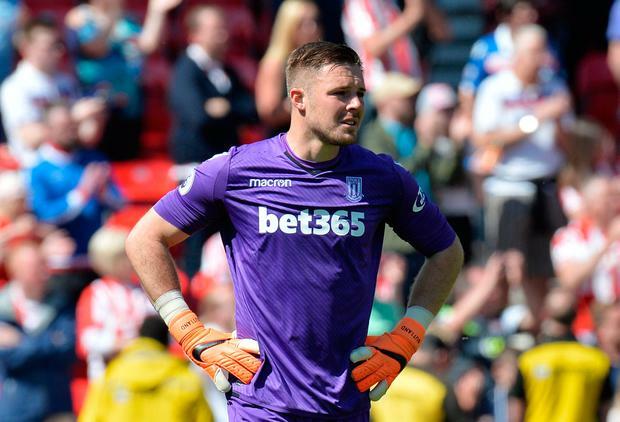 Jack Butland has launched a withering assessment of Stoke City's "farcical" recruitment policy as the inquest begins over the club's relegation from the Premier League. The goalkeeper, who was in tears after the final whistle as Stoke's drop into the Championship was confirmed following their 2-1 defeat by Crystal Palace, believes that the poor signings made over the past two years are a major reason for their plight. Stoke have spent more than £50m on Saido Berahino, Kevin Wimmer and Giannelli Imbula, but none were involved in Saturday's match. Berahino has been excluded from Paul Lambert's plans for persistent lateness and poor discipline, Wimmer is deemed unfit to play and record signing Imbula is on loan at Toulouse. In addition, Jese Rodriguez, signed on loan from Paris Saint-Germain, had his deal terminated early and Ibrahim Afellay was excluded for criticising team-mates. Butland's future is uncertain for different reasons, with several clubs lining up to take him. "Stoke has a massive place in my heart and it hurts because I've given everything," he said. "The whole recruitment process needs looking at. We've gone into a game with half the squad dotted around the world. "Too many of the recent investments have been completely unused and that's unacceptable. It's been farcical. The manager inherited a squad in which there was ill-discipline and players you cannot rely on." Stoke will demand a fee of more than £40m for the 25-year-old England goalkeeper. "The future is not something I want to think about. It's far too raw and too early. This is the lowest point in my career," he said. Bournemouth captain Simon Francis accused Swansea City of "bypassing" their 1-0 defeat on Saturday, saying that it felt like Carlos Carvalhal's side were already thinking ahead to tomorrow's relegation showdown with Southampton. Swansea are now back in the relegation zone with two games to play. They are level on points with Southampton, but have a worse goal difference. Swansea do, however, have a more favourable final fixture, as they host Stoke City, while Saints face Manchester City. "It is interesting how they played," said Francis, whose side were largely untroubled after taking a first-half lead through Ryan Fraser. "I felt, at times, they bypassed this game as a must-win. I think they think Southampton is their cup final." Carvalhal said he had "no reason to doubt" his side's ability to beat Southampton at despite a run of eight games without a victory in all competitions. "Since we arrived, all the games we played at home, we performed really well," Carvalhal said. "I do not have any reason to doubt we can do it." Swansea have now lost three consecutive League games without scoring for the first time since 2012, and have found the net just twice in their last eight.